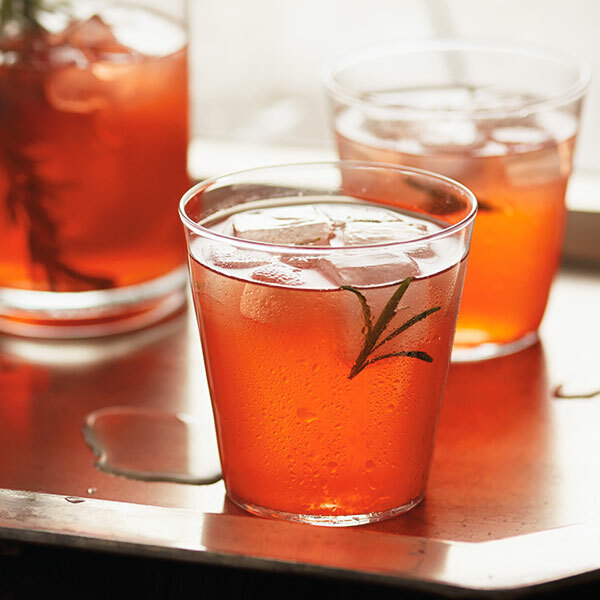 Rosemary creates the evergreen flavor in this citrusy, sparkly wine spritzer. Simple and festive, this white wine spritzer recipe calls for Lillet aperitif, Campari liqueur, soda water, juice from an orange and dry sparkling wine. A rosemary sprigs encased in each ice cube proves to be the perfect delivery system for the herb's woodsy flavor. One day in advance, make rosemary ice cubes. Place a few sprigs of rosemary in each cube section, top with water, and freeze. Remove ice cubes from trays after they are frozen, and store in a freezer-proof bowl. In a small pitcher, mix together Lillet, Campari, soda water and orange juice. Fill a rocks glass or short tumbler with rosemary ice cubes. Fill glass with cocktail mix and top with prosecco. Serve with orange and lime slices.